Is your husband or friends into formula 1 racing? I’ve got a good friend who is mad keen on it. Personally, I just don’t get the fun in going round and round for hundreds of laps and wasting all the fuel, and changing all those tires… but when I put it like that it is kinda like horses strangely! And I can certainly understand his passion for the sport- it’s just like my passion for horses. The thing I find interesting about formula 1 is the importance of the team behind the driver- the pit crew and so forth. While it is the driver that gets all the glory, the champagne and the kiss from the model, without a good support team behind him- without the BEST support team behind him, he would not have made it past the first lap. So how good is your support team? You might say that you don’t have one, but everyone who keeps horses has a team of people behind them that helps them provide the best care for their horses, keep them in top shape as well as helping the rider. Choose the right support team, and it may just give you the competitive edge, or give your partnership with your horse that something extra. 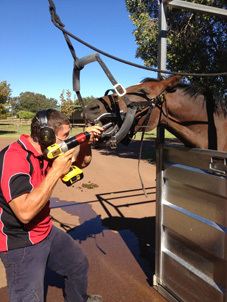 Thing about it- for starters there is the farrier or trimmer. How many threads are there on forums everywhere- “Help! I need a farrier!”. When you find a good one, they are worth their weight in gold. Then there is the dentist. I recommend using a qualified equine dental vet- one that is continuing their training and education all the time. You can find one here. Mojo getting his teeth checked. Your vet, who hopefully you don’t have to see very often. They must have good communication skills and your horse’s bests intentions at heart. Having to go home after speaking with your vet and googling all the terms to work out what they just said is not very helpful! Then there is your stock feeders, your local saddlery, your coach, your saddle fitter, your bodyworker, your agistment manager- all very important people to have a good relationship with that will ultimately play a part in the wellbeing of your horse. My philosophy is that we can’t be an expert in everything, so I think you should find someone who is an expert in what you need to know. Build that relationship and build the trust, and you have the beginnings of a powerful support team. In car racing there are people on the support team that are experts in changing tyres- when you want a 5 second pit stop, don’t you think you want one of those rather than trying to do it yourself? 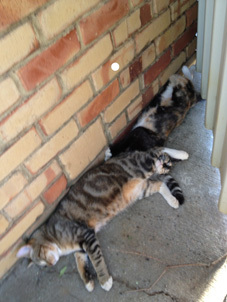 The stable cats hard at work! So, this last couple of months I have been consulting a very special team of experts that have very kindly given me their time and shared their knowledge with me so I can share it with you. I have been working on the next e-book in my series, and this one is on Introducing the Double Bridle. Now I am by no means an expert rider, and have never brought a horse up the grades in dressage or showing and into the double. So, I sought out people that I respected as experts, and very happily, they all said yes! It was a very enlightening experience, and the task of putting all their interviews together turned out to be bigger than I thought it would be (of course). But very soon, the guide will be available on the website, and if you have questions about the double bridle- when to introduce it, what to use, and what to do on your first ride- hopefully you will find some answers. I’ll let you know when it’s ready! The Double Bridle Guide is now available- find it here.